Pretzel buns are a relative newcomer to the fast food scene. Long established in smaller restaurants as a complement to ham and cheese sandwiches, they began to come into vogue last fall as an Oktoberfest ingredient. Both Steak ‘n’ Shake and Red Robin offered Oktoberfest burgers on pretzel, paired with sauteed onions and spicy brown mustard. It’s a traditional German thing, or maybe a Chicago thing too? I dunno. 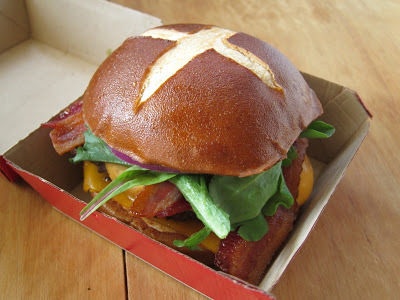 Anyway, the pretzel bun is making the move to more pure commercial restaurants with Wendy’s new Pretzel Bacon Cheeseburger. It’s less ambitious than most Oktoberfest burgers, skewing closer to a basic bacon cheeseburger. I didn’t want to use a stock photo of it because they severely understate how much lettuce there is on it. Look at all that lettuce!! I’m not a rabbit. The Pretzel Bacon Cheeseburger adds a hearty honey mustard to the usual array of bacon, lettuce, tomato, and onion. The cheese used is Cheddar, which is a nice step up from the usual American and suits the pretzel bun well. My only complaint is that mine had a bit too much lettuce. It was good lettuce (I’ve never been a fan of the shredded stuff), but it would’ve overpowered the burger if I hadn’t pulled some off. The pretzel bun has a nice flavor and different texture, but isn’t overly chewy or tough. The burger seemed a little on the small side, but overall was tasty and satisfying. The Pretzel Bacon Cheeseburger runs for about $6-7 in a combo, which is a pretty good deal. If the current trends continue and pretzel burgers continue to expand, you won’t have much trouble finding some to try. So far, though, this is among the best of them, and doesn’t appear to be seasonal. Give it a shot.